The town Karkala is one of the famous and sacred Jain centres of Karnataka. It is the headquarters of Karkala taluk in the Udupi district of Karnataka. Karkala is about 380 km from Bangalore, 50 km from Mangalore and 20 km north of Mudabidri, another famous Jain centre. This historical town derived its name from the Kannada word 'karikallu' (means black stones) which was later changed to karkal and to karkala. The town which was called Pandya Nagari during the period of Jain rule, dates back to 10th century. It was the seat of the Bharisas. Karkala is renowned for two huge statues of Sri Gomateswara or Bahubali, one built in 1432 measuring 13 m in height and the other built in 1604 to a height of 11 m. The 13 m tall statue carved out of a single block of granite rock. 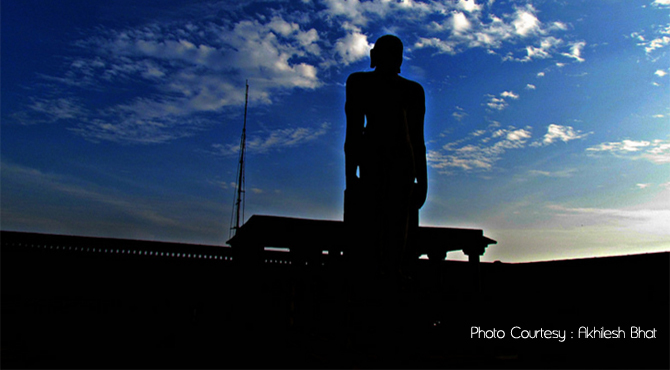 It is the second tallest statue in Karnataka which is situated 1km from the center of the town. This naked figure of the lord can be reached by a flight of rock-cut steps and is among the four giant monoliths found in Karnataka (the others being at Shravanabelagola, Venur and Dharmasthala). These are the splendid works and a testimony to the devotion of the Jain kings of Karnataka. There are four ornate entrance to the shrine, known as Chathurmukha Basti. The statue is surrounded by beautiful landscape on all four sides. The picturesque Ramasamudra lake lies nestled between the Chaturmukha hills. These are the splendid works and a testimony to the devotion of the Jain kings of Karnataka. Besides this, many temples, churches, mosques and about 18 Jain shrines are located in and around Karkala. Some of the places of worship located here includes Jama Masjid at Salmaar, Attur Church of St. Lawrence, Anantha Padmanabha temple devoted to Lord Vishnu, Chaturmukha Basti and Neminath Basti at Hiriangadi, assumed to be built in the 16th century etc. Lord Vankatramana temple also known as the Padu Tirupathi Sreenivasa temple is believed to be more than 550 years old. A ceremony named Mahamasthakabhishekam is held here once in twelve years, where the Gommateshwara statue is bathed and anointed with milk, water and saffron paste and scattered with sandal wood powder, turmeric and vermilion. Thousands of Jain devotees congregate to perform this ritual. The town also has several Hindu temples, Jain Basadis, Mosques, Churches and lakes in Karkala. The other important monuments here include temples and bastis and St. Lawrence Church. The church has remarkably rich history which is said that the Attur-Karkala parish was founded before 1759 A.D. The Ananthasayana Temple and Venkataramana Temple both dedicated to Lord Vishnu also attract a large number of devotees especially Gowda Saraswat Brahmins. This place is known as Padu Tirupati. Saavira Kambada Basadi which is around 29 km away from Karakala is the biggest Jain Shrine in Karnataka. The unique feature of this shrine is that it has a metallix images. Aparts from these, the scenic attractions located here are the Anekere Lake and Ramasamudra pond.